Dr. Bihari was elected Judge of the Constitutional Court by Parliament in June 1999. President of the Constitutional Court from November 2005 to July 2008. Reelected Judge of the Constitutional Court by Parliament on 22 July 2010. He graduated from the Faculty of Law of Eötvös Loránd University of Budapest (ELTE) in 1971. Between 1971 and 1974 he read sociology and philosophy at the Faculty of Arts of ELTE, where he graduated in sociology in 1974. He taught at the Department of Political and Legal Theory from 1970 as assistant, from 1973 as assistant lecturer, and from 1975 as lecturer. Between 1981 and 1984 he headed the Department of College and University Education at the Ministry of Education. From 1984, when a Political Science Group was set up within the Faculty of Law of ELTE, he worked as a full-time director and, when the Group became a Department of the University in 1989, Head of Department thereof until being elected Judge of the Constitutional Court on 2 June 1999. He received his candidate’s degree in 1984, became Doctor of Science in 1993, and was granted full professorship in 1993. Between 1986 and 1989 he worked as Deputy Director of the Research Institute for Sociology of the Hungarian Academy of Sciences, where he also headed the Political Systems Research Group. From 1989 he directed the Party Sociology Research Group at the Political Science Institute of the Hungarian Academy of Sciences, teaching at the same time political theory at the Department of Political Theory of the Budapest University of Economics. Between 1995 and 1999 he was Director of the Institute of Education of the Faculty of Law of ELTE – Széchenyi István College at Gyr, where he taught courses as well. From 1993 he directed Political Science doctoral programmes at the Faculty of Law of ELTE. Between 1994 and 1998 he worked as a Member of Parliament. He has been member of the Political Science Specialist Committee of the Hungarian Academy of Sciences since 1987. 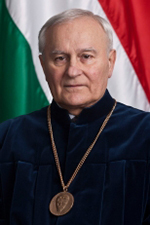 As of its foundation he has also held membership in the Hungarian Political Science Association, of which he served as Vice-President from 1989 and then as President between 1992 and 1994. From 1991 to 1994 he was Vice-President of the Political Science Committee of the Hungarian Academy of Sciences. He was a member of the Hungarian Holy Crown Association from November 2005 to July 2008. His fields of research: political theory, constitutional law, constitutional justice, parliamentary law, political parties and systems of partyes, the Hungarian politics between 1944-2006.